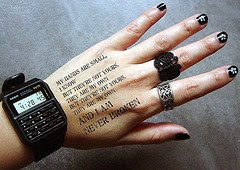 One of the first musicians to draw public attention for getting tattooed was 60s singer Janis Joplin. She had her few small tattoos done by master tattooist Lyle Tuttle. In the 1970s, Cher shocked many by getting a large floral tattoo on her buttocks. Now in her 60s, it's reported that she's having the entire thing, plus subsequent tattoos lasered off entirely. 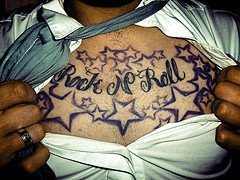 The Stray Cats revived rockabilly music in the 80s, and their personal tattoos helped kick off what is now the "old school" style of ink. 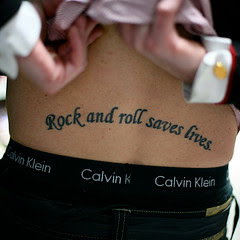 Tattooing has moved so far into the music mainstream, it's not uncommon to see more and more heavily tattooed musicians. Marilyn Manson has full sleeve tattoos. Travis Barker has nearly his entire body surface covered in ink. And if new singer Amy Winehouse continues her current acquisition rate, she too might wind up with majority coverage.